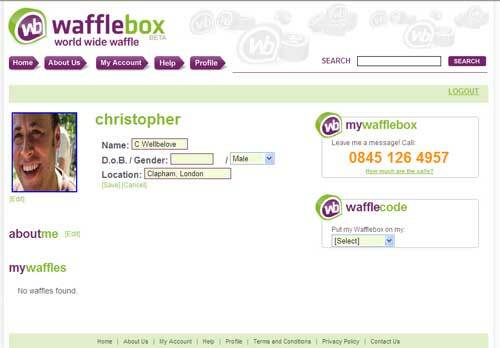 Wafflebox is a free service that enables you to receive voice messages on your website, Facebook profile, MySpace, Friendster, Tagged or your blog. When you join you will be given a unique telephone number, an 0845 number charged at a national rate, your friends can leave a voice message in your Wafflebox which you and your page visitors can listen to on your site. Sign up is fairly easy, though the form is not particularly user friendly. If you pick a username that is already in use (I got the username Christopher) you do not discover this until you have submitted the form and when the form reloads the two password fields are empty and require re-entering. This is the same as the CAPTCHA code, which is not particularly clear and took a couple of attempts to get right. More annoying form problems when you come to edit your profile, I could not fit Christopher Wellbelove in the name box – so C Wellbelove had to suffice. You can manually add phone numbers to an on-line phone book (linking a name with the number that phoned you) though would be better if this could simply take these straight from an outlook address book or mobile sim. Adding to your Facebook profile seemed extremely easy, from the Wafflebox site you click a link which takes you to the application within Facebook which asks for presmission to access your account, however so far I cannot find where it is within my profile for my friends to see. I am not sure why someone would want to ring a national rate number to leave a message when they could type it instead for free. A nice idea though, adding a demension to your page which could be used as a feedback system for a product and service or just for your friends to leave a silly message, sing a song or maybe to wish you a happy birthday. An annoying ‘feature’ I spotted in the help page is that if you do not receive a waffle for 90 days they will take back your number and you will lose any of the messages left. For a new services this seems a relatively short period and not a good idea to annoy your users by making them sign up again for a new Wafflebox which is unlikely to happen. You can leave me a waffle on 0845 126 4957.